This exciting new course focuses on provision knowledge in analytical epidemiology and on how to apply this knowledge in the control of diseases in both human and animal populations (One Health Concept). The course has been designed to train a new generation of human capital which will provide the necessary leadership in solving various health challenges using epidemiological tools to improve the health and welfare our communities. Applicants for the course should have a degree in medicine, veterinary medicine, or a basic degree in biological sciences. Graduates in health related field of study such as statistics, demography, food science and public health may apply provided they have interest in health and have experience of having worked in an institution dealing with health issues. There are limited scholarships available for this course provided by the Wellcome Trust through SACIDS. The MSc in One Health Analytical Epidemiology will be offered by the School of Veterinary Medicine in collaboration with the School of Medicine at the University of Zambia. All the students will be registered by the School of Veterinary Medicine. The School of Veterinary Medicine was established in 1984 and has some of the best learning facilities in Zambia. The School has long standing experience in conducting postgraduate training and research in diseases of veterinary and public health importance. The School is located within the University of Zambia main campus. Course delivery will mainly be done by experts from the Schools of Veterinary Medicine and Medicine of the University of Zambia. Experts from other Southern African academic and research institutions within the SACIDS consortium as well as staff from collaborating research institutions in industrialized countries, especially the Royal Veterinary College (RVC) and the London School of Hygiene and Tropical Medicine (LSHTM) will also participate in course delivery. This will create a blend of professional knowledge and skills in epidemiology and One Health that will provide a unique learning environment. SACIDS is a One Health consortium of southern African academic and research institutions involved with infectious diseases of humans and animals in the Democratic Republic of Congo (DRC), Mozambique, South Africa, Zambia and Tanzania. Staff from these institutions are working in smart partnership with colleagues from LSHTM and RVC - two University of London Colleges which participate in the interdisciplinary London International Development Centre (LIDC). SACIDS also collaborates with the International Livestock Research Institute (ILRI) and continues to forge linkages with other institutions from industrialised countries. The SACIDS headquarters is located at the Sokoine University of Agriculture. "... between animal and human medicine there are no dividing lines-nor should there be." This course aims to equip scientists with skills in analytical epidemiology for the efficient prevention and control of human, animal and zoonotic diseases. One health is a scientific concept whose mission is to foster closer professional interaction, collaboration and educational opportunities across the veterinary, medical and allied sciences for the purpose of improving human and animal health. Demonstrate knowledge of the concept of "One Health" and its application in the development of health policy and the control and prevention of infectious diseases. 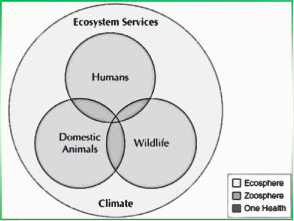 Demonstrate knowledge on how interactions between human and animal populations and environmental changes can lead to emergency and re-emerging of infectious diseases. Plan, undertake and analyze data from a research project concerning human, animal and zoonotic diseases and be able to monitor and evaluate activities for policy and programme development. Apply a scientific style of writing in the presentation of research. Apply economic and socio-economic concepts and methods in the design, implementation and evaluation of health delivery services. Determine the factors affecting the occurrence and spread of disease through human and animal populations and be able to prevent or control such spread. The course is a two- year full-time MSc programme of the University of Zambia calendar of semesters and academic years comprising of a taught component in the first year and a research project culminating into the submission of dissertation in the second year. Year two shall comprise supervised research work culminating into submission of a dissertation and shall be undertaken over a period of two semesters of full-time study. The topic (research proposal) of the dissertation shall be guided by the One Health Theme and shall be approved by the School Postgraduate Committee in the last seven weeks of the second semester of part I. The One Health Analytical Epidemiology MSc programme is supported by SACIDS through a grant from the Wellcome Trust (www.wellcome.ac.uk) under the African Institution Initiative.